The momentous mixed with the mundane on Tuesday, as a phalanx of attorneys and real estate professionals converged on the Washtenaw County Clerk/Register of Deeds office to file paperwork for Pfizer’s sale of its Ann Arbor property to the University of Michigan. From right: At the counter of the county clerk’s office on Main Street, senior clerk Susan Bracken Case reviews documents from UM’s purchase of the Pfizer property, while chief deputy clerk Jim Dries, Liberty Title co-president Tom Richardson and Liberty Title vice president Matt Keir look on. Local governments are one step closer to knowing the impact of a tax appeal that Pfizer is pursuing – and while the news isn’t great, it could have been worse. Last year, Pfizer contested the assessed value that the city of Ann Arbor set for the drugmaker’s former research campus here. 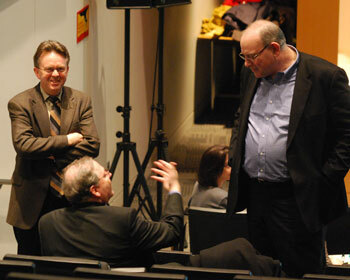 Pfizer, which closed its massive local R&D operation last year, argued that its Ann Arbor properties should be given a dramatically lower assessment – less than half of the value assigned by the city for 2008 and 2009. 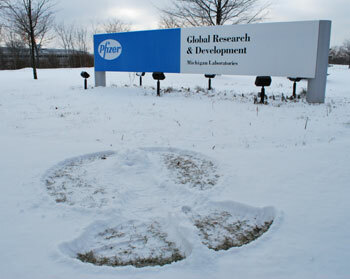 Pfizer's Plymouth Road facility is largely vacated, except for the occasional snow angel. Details are scant, but UM has scheduled a major announcement to be made at this afternoon’s regents meeting: UM will purchase the former Pfizer site.